Solid oak hardwood is heavy, strong and light in color. The natural beauty it exudes brings a warm ambiance to any room, making it a popular choice for solid wood furniture. The Oak Deacon Bench with Storage is an artful display of solid oak, with wide, horizontal back splats, curved side supports and detailed hand carving on the back. The seat is supported by a spacious storage unit to hold blankets, pillows, toys, games and more! 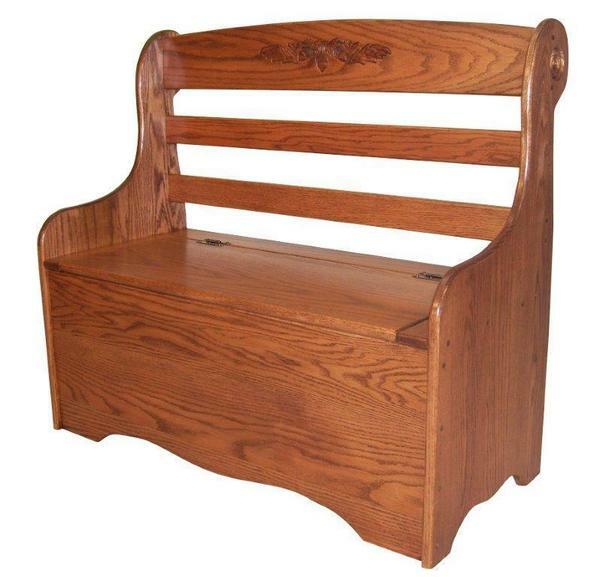 Versatile and beautiful, the Oak Deacon Bench complements your hallway, foyer, family room or playroom easily! Dimensions: Height: 36" Seat Width: 40" Seat Depth: 18" Seat Height: 16"
Choose either a Plain back or a decorative Acorn Carving. Consider our Amish Mission Arm Bench for another option.